Canada used the same suite of 2-inch, three inch and 4.2 inch mortars in the Second World War as the United Kingdom. In addition to a number of project to extend the range or lighten existing equipment, an effort was also made to develop a 120mm mortar based on a Finnish design. As it was considered undesirable to reduce the weight of the bomb (the Italian solution), the best way to extend the range was to boost the muzzle velocity to 800 f/s (240 m/s) seemed to be by using a longer barrel. A design was prepared by 12 October. It comprised a standard 3-inch mortar with a reinforced base-plate and a 3 foot (90cm) barrel extension attached by interrupted lug locks. Preliminary tests, using a standard bomb with a 1,500 grain charge, achieved a range of 4,700 yards (4,200 metres). A 3-inch mortar with a barrel extension, compared to regular mortar. 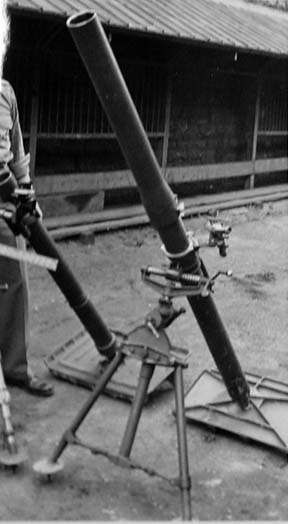 Fitting the barrel extension to a modified 3-inch mortar. The total length of the barrel (6 feet 6 inches – 195cm) was, however, deemed excessive, and likely to expose the crew to enemy fire when loading the weapon. Lt.General McNaughton also requested that the barrel extension be detachable, so it need only be deployed when long-range targets were engaged. A removable 2 foot 6 inch (45cm) extension was therefore devised. Even so, the equipment weighed an additional 331/4 lbs. (15 kg), a feature not likely to endear it to the users. 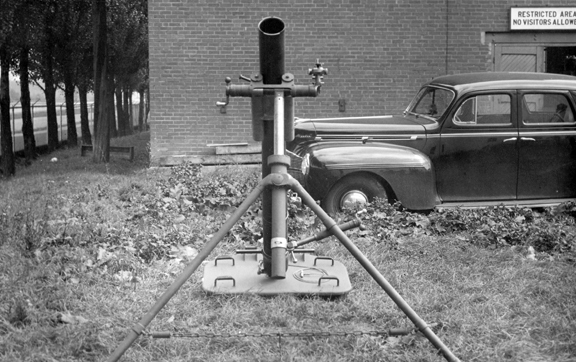 Twelve 3-inch mortars with the detachable 2 feet 6 inch barrel extensions were produced and examples sent to the UK in May 1943. They were tested at Shoeburyness on 3 and 4 July. The tests were not successful, as the British used the standard, not the reinforced base-plates. Further tests with proper base-plates were carried out at Petawawa on 17 and 18 July. An impressive range of 5,160 yards (4,600 metres) was attained, but accuracy proved to be very disappointing – at a range of 4,600 yards (4,200 metres) 50% of the rounds fell within a zone 651 yards long x 45 yards wide (600×41 metres). The barrel and extension stood up to the stress, but after prolonged fire the welds in the base-plate showed signs of cracking. It also proved difficult to remove the barrel extension after prolonged fire. A comparison of a reinforced base plate of a 3-inch Mortar Mk.II with that of an Italian 81-mm Stokes Brandt mortar taken in August 1943. The British had had similar experiences in experimenting with an 18 inch (45cm) barrel extension, while other solutions, such as reinforcing the barrel and baseplate to take a higher propellant charge also posed unacceptable weight penalties. In September 1943, the British Board of Ordnance stated it would not accept any designs which significantly increased the weapon’s weight or barrel length. Board of Ordnance research also revealed the bombs became unstable as their muzzle velocity passed 700 f/s (210 m/s). The Board also questioned the utility of being able to send a relatively light projectile to such range, given the problems it posed in spotting the bombs’ impact. 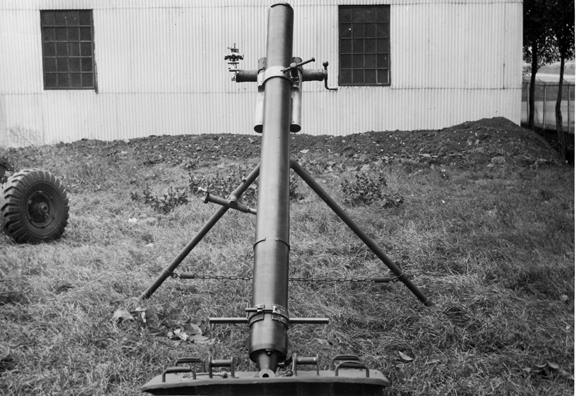 In November 1943, DND’s Directorate of Vehicles and Small Arms (DVSA) made enquiries about the USA’s success with a barrel extension device for their 81mm mortar (which saw some limited use in the Pacific theatre). The USA overcame the stability problem by fitting an extension to the bomb’s tail, and using a slower-burning propellant to create a higher pressure. DVSA wished to have the National Research Council (NRC) do research into this to determine the optimal tail length, however, in March 1944, the ATDB agreed that the project be terminated – the mortar’s poor accuracy and increased weight were unacceptable. After the War, the Canadian Armament Research and Development Establishment – CARDE)  undertook some trials using various barrel lengths to determine if there was a correlation between mortar barrel length and range and accuracy. These were completed in 1948, and found while it had little effect on accuracy, there was a marked correlation between barrel length and range. In late October 1941, Lt.General McNaughton sent the London representative of the Department of Munitions and Supplies (DM&S) copies of drawings of the Finnish Tempella 120mm mortar (m/40), which was based on a French Brandt design. In his covering note, McNaughton noted that, as the War progressed, there would be a need to develop new or improved weapons and that to a large extent this would be the responsibility of DM&S new Army Engineering Design Branch (AEDB). He suggested that there could be no better project for the AEDB to get started on than the development of a Canadian version of the 120mm mortar. McNaughton envisaged a weapon capable of firing both chemical and HE rounds, with a range of 7,500 yards (6,700 metres). Its proposed roles would include: increasing the firepower of Chemical Weapons Companies and Brigade Heavy Support Companies; thickening artillery shoots; relieving the artillery of saturation tasks with HE, smoke or CW rounds; and providing a Brigade-level mobile fire power reserve. On 10 January, 1941, DM&S advised the MGO of McNaughton’s wishes. On 29 May 1942, the project was considered by the ATDB, which approved it as Project 10, assigning it to DVSA. A contract to produce six pilot mortars was given to Dominion Engineering of Longueil Quebec, while DM&S was responsible for developing the rounds (a French Stokes-Brandt mortar bomb was used as the model). An initial 100 weighted rounds were ordered for range and accuracy (R&A) trials, to be followed, once the bomb design was proved, by an additional 500 rounds per mortar. Modified 3-inch mortar sights were used. The original two wheel trailer used with the Tampella mortar was adapted to motorized towing. In May 1943, the War Office expressed some doubt about whether there was a requirement for this equipment. CMHQ justified the project’s continuation in light of intelligence reports that the Germans had reverse engineered the Soviet 120mm mortar, were issuing them on a generous scale, and making very effective use of them. The pilot mortars were completed by 24 November, 1942. On 16 December, four were shipped to the UK. The ammunition took longer to produce and was not available until March 1943. Trials took place in Shoeburyness in the UK in June, and at Petawawa, in July. The mortars themselves performed very well and showed no signs of bulging, nor was there damage to the baseplates. The bombs’ performance, however, was disappointing. The propellant tended to swell in damp conditions and had to be sanded to allow the bomb to slide down the muzzle. The tail design was a major weak point, frequently detaching (sometimes while still in the mortar). Worse still accuracy was poor, with a very disappointing 50% zone. A front view of the Canadian 120mm mortar. Wind-tunnel tests at the NRC indicated that a six rather than twelve-finned tail might reduce the tendency of the bombs to yaw in flight. This was tried, but tests in December 1943, showed they remained very prone to fracture. At the same time, steps were being taken to develop a self- loading device, based on preliminary sketches developed by Lt.General McNaughton on 29 June, 1943. 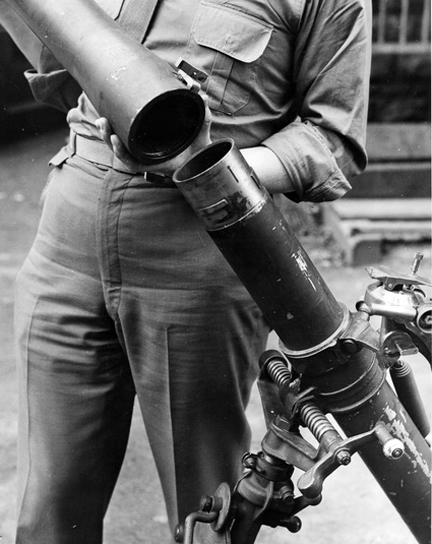 As well as seeking to alleviate crew-fatigue, McNaughton was concerned about the exposure of the loader when operating the mortar at high angles. It was hoped a rate of fire of 30 rounds per minute unaimed, or 10 rpm aimed could be achieved. (Crews of the manually-loaded German GW42 could sustain an aimed rate of fire of 8-10 rounds per minute). In April 1944, the project was transferred from DVSA to DArty. In June, bombs with welded tails were fired at Valcartier. A m/v of 1060 f/s (310 m/s) was attained, with satisfactory stability. In July the designs for the propellant and exploders were finalized and approved. International Flare and Signal of Waterloo, Ontario was contracted to produce 100 bombs, which were shipped to Suffield Alberta for trials. These took place in the first week of October 1944. While there were clear improvements in performance, the overall results were still disappointing. Some 121/2% of the bombs still became unstable due to tail defects. 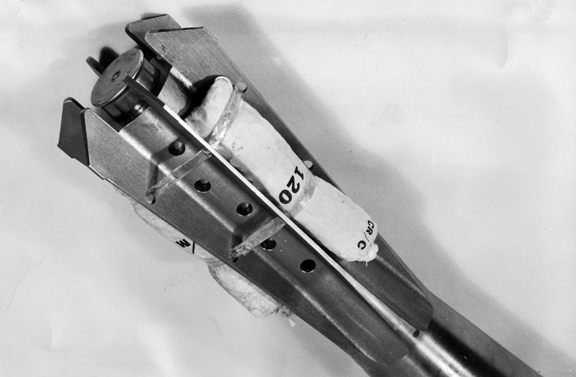 The rate of fire was deemed to be too low, due to the bomb weight; fouling caused the firing pins to wear out very rapidly (the tubes had to be cleaned and the pins replaced every 10 rounds); and – due to excessive clearance between the driving band and the mortar tube – there was poor obturation While fixes were identified for these problems, the ATDB proposed scraping the project, deeming it obsolescent. A rear view of the Canadian 120mm mortar. Nonetheless work did continue. In February 1945, DArty tried to get an example of the Russian M38 120mm mortar, to see why it worked so well, while the Canadian version did not. 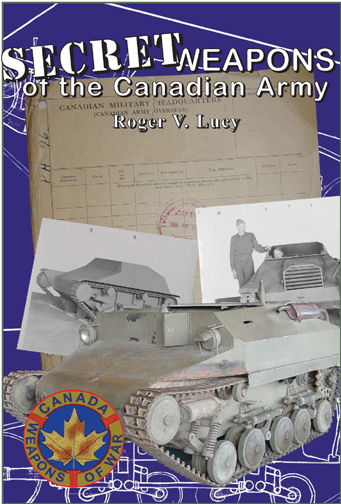 The US War Department refused the loan – policy precluded lending one country’s equipment to a third country – but Canadian experts were allowed to go to Aberdeen Proving Ground to examine a specimen and take measurements. It was noted that barrels of the Russian mortar and its German imitator were some 10cm shorter, and had a m/v some 100 f/s (30 m/s) less. This likely helped improve accuracy, albeit at the expense of range (6,500 vs. 7,500 yards). They determined that while the M38 bomb was based on the same Brandt design, poor placement of the charges and faulty manufacturing had contributed to the weakness of the Canadian mortar. On 7 May 1945, the ATDB approved project 88, a proposal by DArty to develop a “fish-tailed” bomb for the 120mm mortar. In this radical redesign, the fins were machined in one piece with the body and extended halfway up. It was hoped they would be less prone to fracture and excessive yaw. By fitting an expanding gas check and minimizing contact between the tail and the mortar tube, it was also hoped to improve obturation and reduce friction drag. The design was completed on 8 June and in July Dominion Engineering of Montreal received a contract to produce 20 pilot bombs. These were completed in September and sent for trials at Valcartier, and later at Suffield. Tests continued under under the aegis of CARDE until November 1946. These trials concluded that, while less prone to tail fractures, the fish-tailed bombs offered little advantage in terms of range or accuracy, over the conventional design. In response to DAD’s query of 24 July, 1947 whether there had been any further tests, CARDE responded, that there had been none and recommended that the project be dropped. Thus, after the completion of six equipments and 700 bombs, the Canadian 120mm mortar was allowed to pass into oblivion. The failure of this project – based on existing designs – stands in stark contrast to the Germans’ success in rapidly reverse engineering and modifying the Russian M38 120mm mortar, and fielding the first examples of their highly successful Granatenwerfer 42 by late 1942. The “fish-tailed”120mm mortar bomb, which unsuccessfully tried to correct the ammunition shortcomings of the Canadian 120mm mortar. ammunition heat treated steel shell with mild steel tail, weight 39 lbs. (17.7 kg) less chargesHE (50/50 amatol), CW and WP smoke rounds proposed. While efforts to develope a 120mm mortar and to extend the range of the 3-inch mortar went nowhere, other R&D effort went into lightening existing equipment. 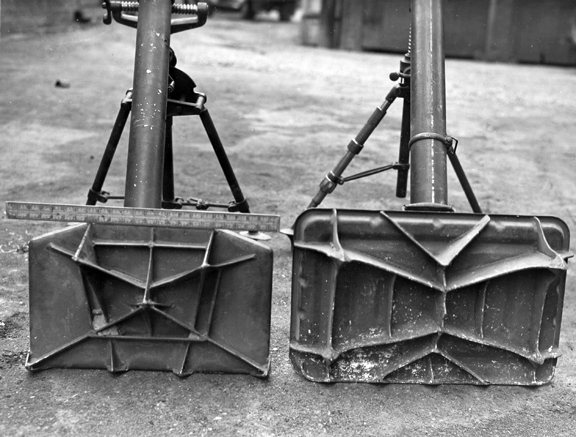 In response to a December 1943 War Office request for a lighter baseplate for the 3-inch mortar than the standard 37 lbs. (16.8 kg)version, the ATDB approved project 67 on 14 March, 1944. It was assigned to DVSA, which developed two designs. 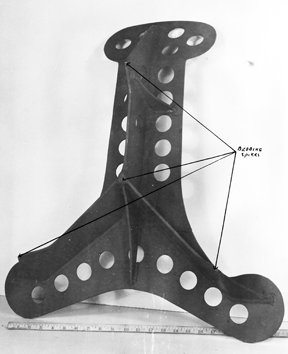 One, a three-footed high tensile steel base-plate with lightening holes, weighed only 25 lbs. (11.4 kg). The other, made of magnesium alloy, was trapezoidal in form and weighed 26 lbs. (12 kg). An aluminium alloy version was also investigated. After tests at Long Branch, which revealed problems with the welds in the steel base-plates, the final versions of the prototypes were completed in May 1944. After successful tests at the Canadian Small Arms School, samples were sent to the UK, USA and Australia for trials. The magnesium base plate performed particularly well on loose soil and gravel. Unfortunately it fractured after three to rounds in British Board of Ordnance tests – which used the Mk. IV barrel – the Canadian version had been designed around the Mk.III. The steel baseplate, while commended for its lightness, was deemed unsatisfactory for its lack of stability. After redesign work more pilots of both the steel and magnesium plates were produced and shipped to the UK. Trials by the Board of Ordnance continued to the end of 1945. In August, cancellation of further work on the magnesium plate was recommended due to the end of hostilities and its failure when fired on concrete. The steel plates also failed the Board of Ordnance trials and the project was formally terminated by the ATDB on 28 January, 1946. Work was also undertaken, as part of the project, on a lightened bipod made of magnesium alloy. Lightened base-plate for a 3-inch mortar, socket side up, June 1944. Lightened base-plate for a 3-inch mortar, under-side, June 1944. 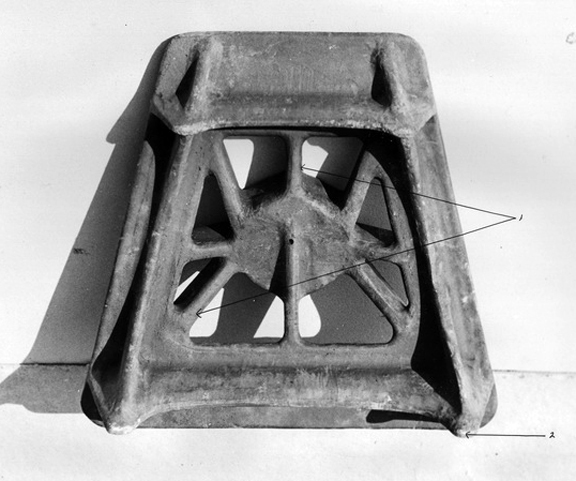 Lightened base-plate for a 3-inch mortar, side view, June 1944. 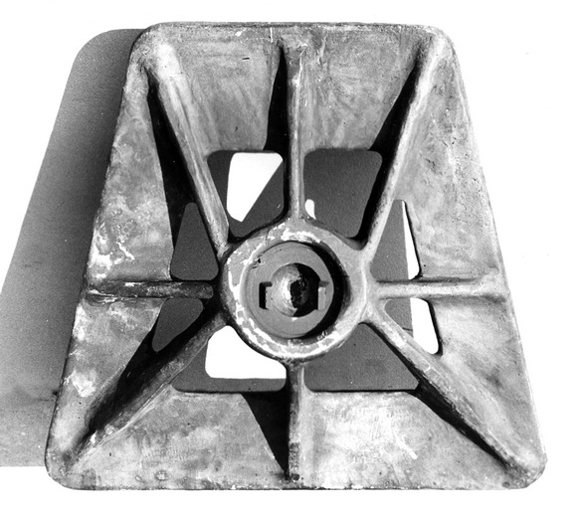 A design for a lightweight 3-inch mortar base-plate made from high tensile steel. Canada did, however, continue to work on a longer term project (No.68 approved on 11 July, 1944) to redesign the 3-inch mortar to increase its range and accuracy. One problem with mortars, which are smooth-bore muzzle-loading weapons, was achieving the right degree of clearance between the tube and the bomb. If too tight, an air cushion is created, which slowed the bomb’s descent down the tube and making it impossible to fire without a trigger mechanism. If too loose, the mortar’s poor obturation and the resulting windage reduced the range and accuracy of the projectile. In April 1944, DArty proposed a 3-inch mortar with a tapered barrel, designed so that its internal diameter swelled from 3.185 inches (79.6mm) for the first 12 inches (30 cm) below the muzzle to 3.207 inches (80.2mm) at the breech. This eliminated the air cushion and improved obturation, thereby reducing windage and increasing the stability and range of the bomb. By fabricating the mortar from high tensile steel – to take a heavier charge – and adding 2 inches to its length, it was estimated the range could be increased to 3,500 yards (3,200 metres). However, on the advice of the Inspection Board, which reminded DArty that increased muzzle velocity degraded accuracy, the project focused on reducing weight and improving accuracy. Following the successful testing of two mild steel barrels, the ATDB authorized the construction of two high tensile steel pilot models, weighing only 28 lbs. (22 kg) compared to the 44 lb. (20 kg) barrel of the 3-inch Mk.IV mortar. In January 1945, three more prototypes – modified to reflect the earlier trials – were ordered. Two were sent to the USA, one for tests by the US War Department, the other for tests by Australia. Trials in March 1945 showed this design offered a 25% reduction in overall weight, a 10% improvement in accuracy and a 15% increase in strength. Five more barrels were ordered. Trials in April, firing 58 rounds to 2,900 yards (2,600 metres) showed dispersion similar to the standard 3-inch mortar. The Australian trials, in May 1945, also showed a significant increase in accuracy. The project was deemed a long term one (to be continued after the end of the War) and trials were still going on when the ATDB was disbanded at the end of 1946. A drawing showing the barrel of a tapered barrel mortar. Work on the tapered bore mortar continued into the late 1940s, including arctic trials at Churchill, Manitoba, in the winter of 1948/49. While liked for its ease of mounting and operation, further design changes were recommended to improve performance. Despite the design’s promise, there does not seem to have been any further development. One reason may have been CARDE’s opinion that, notwithstanding improvements in accuracy and ease of loading, mass production of a mortar tube with an internal taper would be difficult. Postwar efforts in mortar development- concentrated instead on achieving greater ranges using finer tolerances in the design and manufacture of the bombs. Work was also done, from 1945 to late 1946 on a “drag-tail” 3-inch bomb. Such a design would permit better placement for the secondary charges, reducing damage to them when loading, and allowing longer ranges – up to 4,000 yards (3,600 metres). The bombs however, became unstable when used with No.9 and 10 super-charges, and the tails showed a tendency to fall off. Work was also initiated on a lightened baseplate for the 4.2-inch(105mm) mortar, using high tensile steel. Project 81 was approved on 14 December, 1944. By January 1945, three prototype baseplates had been produced, weighing 82 lbs. (41 kg) – 40 lbs. (18 kg) less than the issue baseplate. Trialed in February, stability was very good; the lighter plates did not sink into the ground as readily as standard plates and were easier to unbed. There was one problem – when fired at high angles and extreme traverse – the plate fouled the bipod legs. For more information on the role of these organizations in R&D, and how the ATDB in funded the development of new equipment see Secret Weapons of the Canadian Army, Service Publications 2006. CARDE amalgamated a number of military R&D facilities at Valcartier in early 1945.